Although I’m no stranger to a spot of amateur Endurance racing this was going to be the first Scott MTB marathon I’ve made it to. But after being seriously ill after Christmas I was so excited about getting back on my bike to attend what is widely regarded as the original single loop off road mountain bike event in the UK. So excited that I left from the East of England on the Wednesday before to start the MTB pilgrimage to Builth Wells for the opening event of the series and a chance to meet up with my Team mates from @1elevenCC. Wednesday morning I woke as excited as a Labrador at the prospect of a steak dinner. Coffee in hand and bikes packed It was time to leave the house, via Cannock chase, Hopton woods, Credenhill, The Long Mynd and wild Shropshire before final destination of Buitlh Wells. The event consists of a Night Ride sponsored by USE Exposure Lights, aptly being named the Equinox 20km and the Maxx D 40km. With a multitude of routes for the next day of 25km 45km and 65km with feed stops provided along the marshalled course. Without wanting to sound too British an event in April, especially Wales in April was always going to be a bit of an unknown weather wise.. This one turned out to be a SCORCHER… The night before the event my trusty single track dog and I made the effort to get a nice spot to sleep in the van as it was such a clear night and great to get out of the light pollution of Essex. So we chose the top of the long Mynd as our make shift camp. What we woke up to was quite simply beautiful and happened to set the tone for the whole of the weekend. Perfect crisp blue skies with the hilltops breaking a low lying mist like the birth of an emerging landscape at the dawn of time. The day was too good to miss even though I should really be saving my legs for the weekend of riding. But hell to it….. They were tired anyway and the maestro Jon at E3Coaching had set me a good block of riding to get me back into the swing of things after some pretty pity full training over the last couple of months. 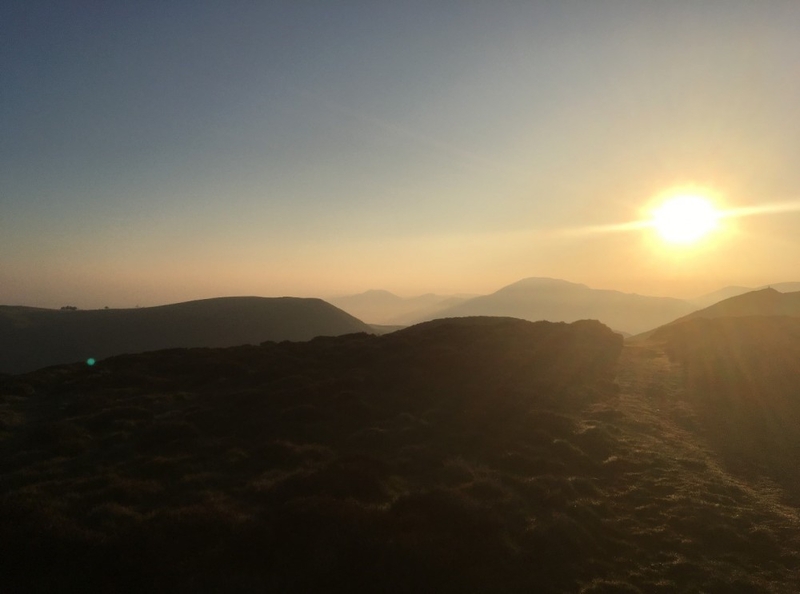 I wanted to get to Builth as I could see from the rather active twitter feed @mtb_marathon that people were starting to arrive and get into the swing of the weekend of free camping, coffee, beers and general good times. I pulled up, got the bike out and headed straight out for a ride, following part of the route onto the ridge line that overlooks the event and forms part of the Marathon on Sunday. I chose to do the 40km Maxx D and the Full 65km route for the next day which was going to be a bit of a shock to the system but at least there would be a few hundred people sharing in it with me. The field for the night race was made up of a mixture of riders ranging from WEMBO champions to first time night riders. The grid was buzzing with a real friendly vibe and a breath of fresh air from some of the races I have done in the past. We set off straight out of the grounds behind a pace car (quite cool really) where I imagined myself as a Moto GP rider like Valentino Rossi… before we hit the first 20 or so minute climb where I felt more like an amateur MTB racer on tired legs.. But it was nice while it lasted. The fast boys were out of sight almost as soon as the pace car pulled off. I settled into a rhythm on my trusty Salsa Spearfish and got chatting with a couple of riders who were travelling at a similar pace. That’s the beauty of the longer events and especially the Scott MTB series it seems, there is a kind of comradery amongst the riders that you don’t really get at some of the shorter races. The riding was a mixture of open mountain sides. Off camber sheep trails, miniature bog crossings but on the whole dry and fast enough to peel back your eyelids in parts. I was mostly dry clean and warm when I hit the top of the last decent. I flicked the lights onto high throwing battery charge caution to the wind when it happened. The trail narrowed the mud got deeper and it got steeper. This was muddy slippy rutted pick a point in the distance and hope for the best riding and to be honest I was loving it. My tyres started by gripping well before turning into some sort of Flintstones type rollers that rubbed on the frame. Luckily here was time to clear them off on the closed roads of the quarry on the ride to the finish. The finish was cleverly designed to run through the undercover event village that was all lit up and buzzing with the atmosphere of the event weekend in full swing. A quick change, protein shake jet wash of the bike at the provided cleaning area and a makeshift washing line in the van to dry kit ready for the morning and it was off to bed in preparation for the long day tomorrow. If the course was as fun as the night one then we were in for a treat. Morning broke roughly at the same time people were detecting the previous days sunburn on their slightly lobster tinged arms and faces. It would be fair to say I was buzzing at this point a couple of months before I had been layed up on a surgical ward with a fair chance of not ever riding again. This was by far preferable. Sunshine MTB’s, great people and fast dry trails… It’s the stuff dreams are made of. The route started off up the road again after another ace car, the usual mix of red lining racers and sensible pacers served to start spreading the field out on the first climb off the road and onto the ridgeway from the previous day. The riding was again a mixed bag of single track, off camber sheep trails which were quite challenging in parts and silly fast descents where I was feeling a lot like someone who lives in a flat area and a bit out of practice with the gravity fed stuff. After the first feed zone which served the usual sweets, bananas and most importantly water with added carbs and electrolytes courtesy of sponsor TORQ. There was my favourite part of the ride, a medium length climb, steep in places before a fast challenging decent with a little bit of everything thrown in. It took us through some open double track before going into the shaded cover of the trees where we met roots and line choices that kept you thinking and engaged to just go faster and faster. For those of you who remember mint sauce from the 90’s. This is where I imagine he lives. The day got a bit hard for the next hour or so as the fatigue from the previous weeks riding started to take its toll. Helped on by the pack of riders I was traveling with which was made up of fathers and sons and a rider from Dublin who had travelled over especially we pushed on round the longer loop making gains where we could and enjoying the great non trail centre riding on offer. Somehow I found myself in no mans land about 8km from the end and making steady progress on the run in to the finish when I was caught by a couple of riders before the last road section. After trying to do the adjust my shoes and all the normal not wanting to be on the front of the pack things, it was evident that it was going to be me leading it out. The three of us turned the corner into a short steep climb into the arena at the same time and the sprint was on. We may have been in the mid pack mediocrity but this was where the race was now. We were it. Man on man… We all dug deep.. Wind sucking through ear to ear smiles… I gave it everything I had .. Legs burning and lungs screaming I crested the hill alongside who in my oxygen starved brain at the time was Nino Scurter!! Only to find that there was a bit left… The medal was mine… Like the castle of Grayskulll… I HAD the power..!!!! Finish line, protein shake and sleep. If this is what the rest of the series is like then count me in. 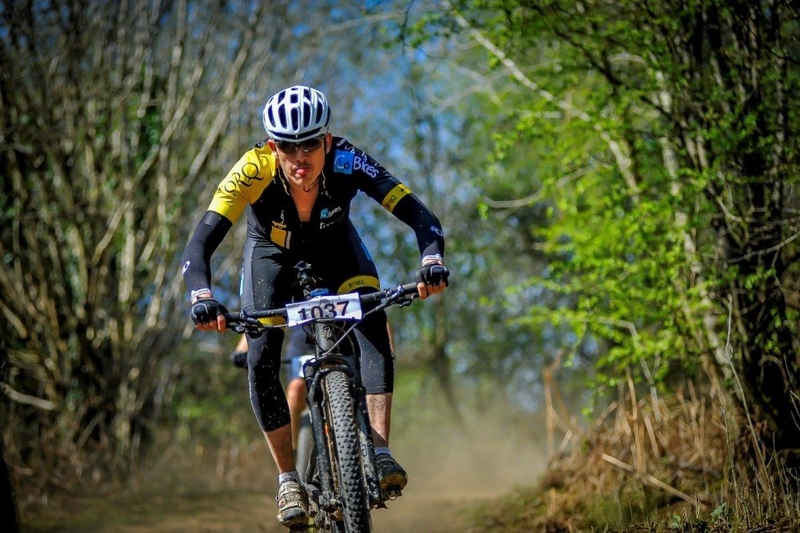 Thank you to the organisers, sponsors and Cycle-tec Events ltd for a great weekend.